4 pouches of 3 biscuits. 64 calories per biscuit. High fibre. 35 less sugar than the average sweet biscuit. Gluten free wholegrain oats. No GM ingredients. No hydrogenated fat. No artificial colours, flavours or preservatives. Suitable for coeliacs. 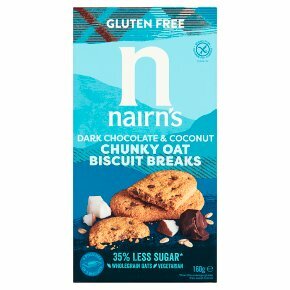 Suitable for vegetarians.35% less sugar* *Than the average gluten free sweet biscuit A little treat... *We've compared our oats, chocolate chip & coconut chunky biscuit breaks to over 100 sweet gluten free biscuits, and the good news is they contain 35% less sugar than the average of all those biscuits. Our biscuits are packed full of wholegrain oats which are naturally delicious and wholesome. Wholegrains are a rich source of fibre, vitamin and minerals - oats are high in soluble fibre and also naturally contain manganese, phosphorus, magnesium, zinc, iron, folate, vitamin B6 and thiamin. Perfect on the go Our tasty chunky biscuit breaks come in handy pouch packs making them easy to pop in your bag for a mid-morning or afternoon snack on the go. Or simply enjoy them as the perfect accompaniment to your favourite hot or cold drink at any time of the day.